This issue is encountered when you place the .Cab File and .exe file in different locations. Or if you have downloaded only the exe file. The is because the Cumulative Package is dependent on the ‘ubersrv_1.cab’ file and hence both the exe and the cab file need to be in the same location for the installation to complete successfully. Locating Both Files in the same location will execute and complete the installation successfully. Had an issue In a Staging Environment at one of my client. I have installed August 2013 Cumulative package at SharePoint 2013 Staging Environment which is an basic single server setup. Tried several times through Configuration wizard and also PowerShell (PSConfig.exe –cmd upgrade –inplace b2b –wait –force) but no luck, continuously getting this error. 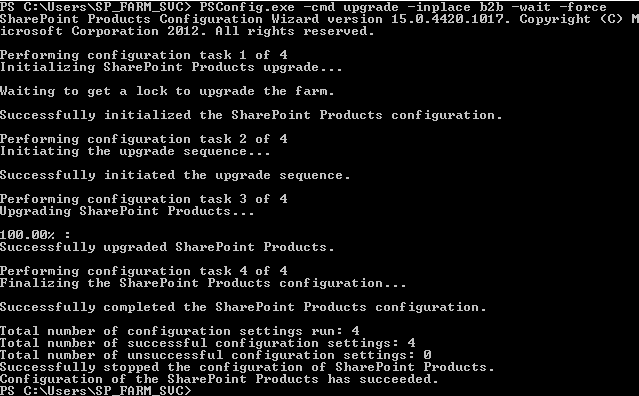 saying – " Configuration of SharePoint Products failed. Configuration must be performed before you use SharePoint Products. For further details, see the diagnostic log located at C:\Program Files\Common Files\Microsoft Shared\Web Server Extensions\14\LOGS\PSCDiagnostics_3_9_2011_14_18_42_272_416955813.log and the application event log. " in Both Wizard and Powershell. Finally carried out below steps in order since it was suggested by someone on web. Then Run "PSConfig.exe –cmd upgrade –inplace b2b –wait –force"
After Removal of the Damaged Web App (Database still remains as it is in DBS) ran the Wizard again just to check. And yes It’s gone smoothly this time. So if you face an similar kind of a scenario just check basic stuff first step by step if your Event viewer/SharePoint Log doesn’t contains much details on the occurrence. Also sometimes after installation of CU/Service pack Wizard does not just become success in first run. If you prefer Wizard, just run it once again. I would recommend Shell Command (above) for this as it’s more reliable.